In the hours after United Airlines Flight 93 plummeted into a reclaimed strip mine on Sept. 11, 2001, a neighbor to the Somerset County crash site described the scene. “I was in the area, heard the loud boom, followed the smoke to the site,” the man told a Mirror reporter after the crash. What he saw was a crater left by the plane’s impact — a hole in the earth about 8 to 10 feet deep and 15 to 20 feet long. Today, visitors to that same site will celebrate a 93-foot tall tower reaching toward the sky, which was built to honor the passengers and crew members who died on the historic date. 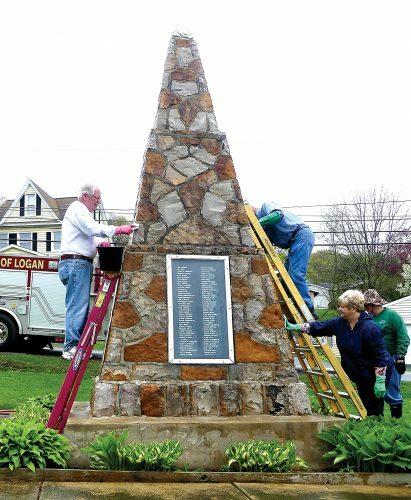 “It really is a symbol of the courage of the 40 men and women on that airplane,” said Stephen Clark, the Flight 93 National Me­morial’s superintendent. It’s called the Tower of Voices, and its dedication is scheduled for 1 p.m. today. On the morning of Sept. 11 — 17 years ago — 33 passengers and seven crew members boarded the plane scheduled to fly from New Jersey to California. Also on board the plane were four terrorist hijackers. But on Flight 93, passengers rushed the cockpit, likely forcing hijackers to crash into the vacant field in Shanksville, authorities have said in the decade-plus since. It’s those actions that inspired the 93-foot tower, which features 40 large metal wind chimes. Design and construction of the tower came at a total cost of nearly $6 million. The project was funded by a grant from the National Park Foundation, Loeb said. 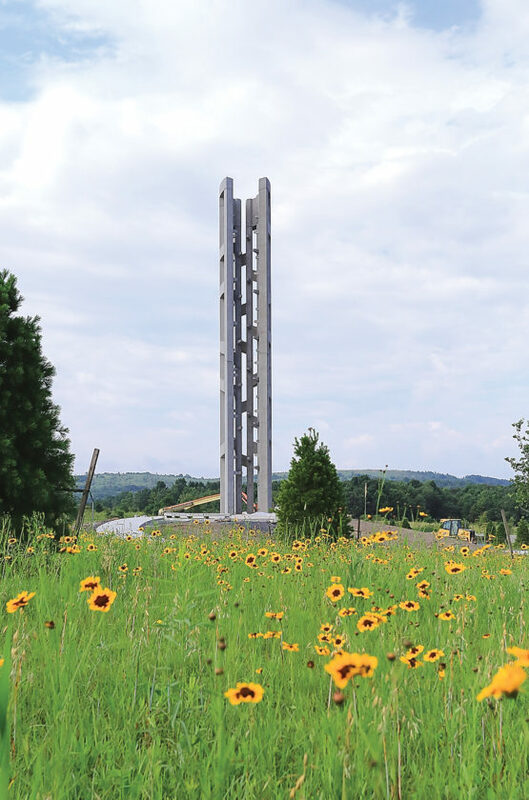 And more than $46 million was donated by individuals, foundations and companies to help cover costs associated with the Flight 93 National Memorial, including the Tower of Voices and Visitor Center Complex, which was opened to the public in 2015. Two years later, in September 2017, it was announced that Altoona-based L.S. Fiore Inc. was awarded a $3.4 million contract to construct the concrete Tower of Voices, which was designed by a Los Angeles architect. Construction began a few days later. Late last month, project Superintendent Guy Fiore described what it was like to work on the tower, which has attracted national attention. Construction began with utility work last September, and, since then, contractors have been working to erect the precast tower on the grounds of the Flight 93 National memorial. At times, that has been difficult, especially with this year’s above-average rainfall, Fiore said. Despite that rain, the tower was mostly complete late last month, but the 40 chimes had not yet been installed. 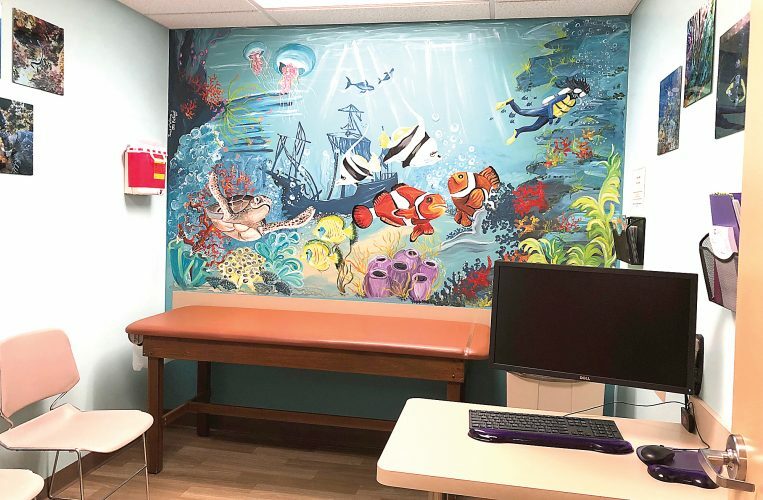 “I think the end result is pretty much like the picture,” he said of the contractors’ and subcontractors’ ability to match the architect’s design. Fiore said the chimes were expected to be delivered in the last week of August. “They are all musically tuned to within two tones of each other,” he said. Those tones, Clark said, are intended to represent the voices of the passengers and crew members aboard the plane. The chimes will be solely activated by the wind. The wind will produce a new “song” every time the chimes sound, Clark said. Shanksville and the Flight 93 crash site sit about 72 miles from Altoona in rural Somerset County. In the hours after the plane, a Boeing 757, crashed into the reclaimed mine, Mirror reporters spoke to those who lived in the Shanksville area. One man told reporters he watched as the plane flew low and slanted to the ground, impacting it and exploding into a fireball. Another said he didn’t see the impact, but described what he heard. “It sounded like a bunch of dynamite going off. It shook the house, and we didn’t know what it was until a relative told us. I got here, and all of these police and firefighters were out there, and they told me that it was an airliner that went down,” the man said shortly after the crash. Then-state police Capt. Frank Monaco spoke about the gravity of the situation. “We always have drills to try to prepare for disasters like this, but even so, how can you truly prepare for anything like this?” Monaco said, according to a Mirror report published Sept. 12, 2001. Locally, in Blair and Cambria counties, schools dismissed early and extracurricular activities were canceled. Church leaders hosted prayer services and vigils. All flights nationally were grounded. And local emergency responders traveled to New York and Washington, D.C., to help. Now, locals often make trips to the Shanksville crash site to pay their respects to those who died in the crash, Clark said. But they are not alone. Americans from across the country and even international visitors have traveled many miles to see the crash site, visitors center and memorial Wall of Names, Clark said. “This is what we call a destination for a lot of folks,” he said. And it is likely that the Tower of Voices will attract even more visitors, who will see it from the road long before they reach their destination. “It’s absolutely magnificent to see this welcoming beacon,” Clark said.